This is going to be incredible! If this is successful then probably other smartphone manufacturers will try to follow the same. Gionee M5 will reportedly come with a dual battery design, which can provide battery life upto 4 days. The size of the batteries are not known yet. But according to the rumours each battery will have 2,500mAh capacity. 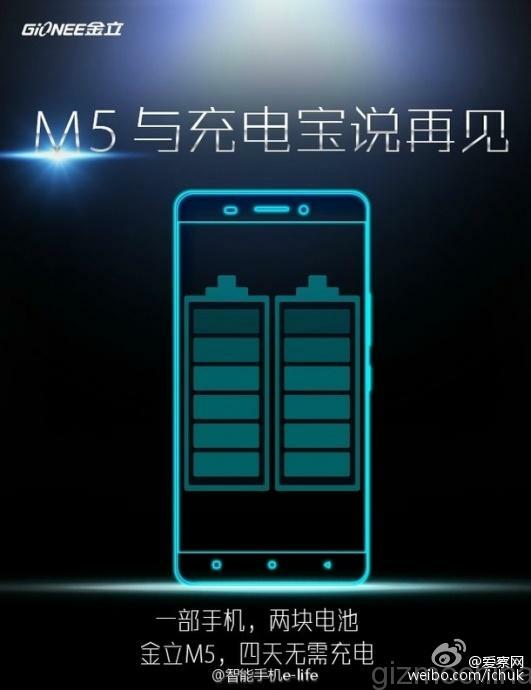 Gionee recently published a teaser which showed their new smartphone Gionee M5’s dual batteries design. Yes, the phone will come with two batteries inbuilt and users can decide which one they can use. Even if one battery is out, the user can still use the secondary battery. When the two batteries are fully charged we may get upto four full days of charge. We have no idea about how long it’ll take for the two batteries to charge fully. With two batteries inside we are not sure about the size of the smartphone (or neither the battery) but it wouldn’t be more than 6-inch. It just feels like dual SIM smartphones, you can get two options for calling. When one network doesn’t have signal you can try the other one. We already have dual cameras and dual screens on smartphones as well, now it is time for dual batteries smartphone. Whenever I buy a smartphone I badly worry about the battery life, then comes the design and features part. I don’t want to use my smartphone as my landline. If Gionee can successfully do this and make a change, then probably it’ll be a good start for other smartphone market rulers to implement the same soon. This is going to be an USP for Gionee M5. Gionee didn’t reveal any other official details about this smartphone, but we’ll wait and update more related news. Apart from other decent specifications I badly wish the smartphone is thin enough to match their competitors.